BUT- I had to make it vegan- I just had to! While getting lost in the cookbook section of a Long Island bookstore, I stumbled upon VIVA VEGAN: 200 Authentic and Fabulous Recipes for Latin Food Lovers by Terry Hope Romero. I am a lover of many things latin– so obviously, I bought it! I am just now going through looking for healthy recipes or just famous dishes that I love so much. 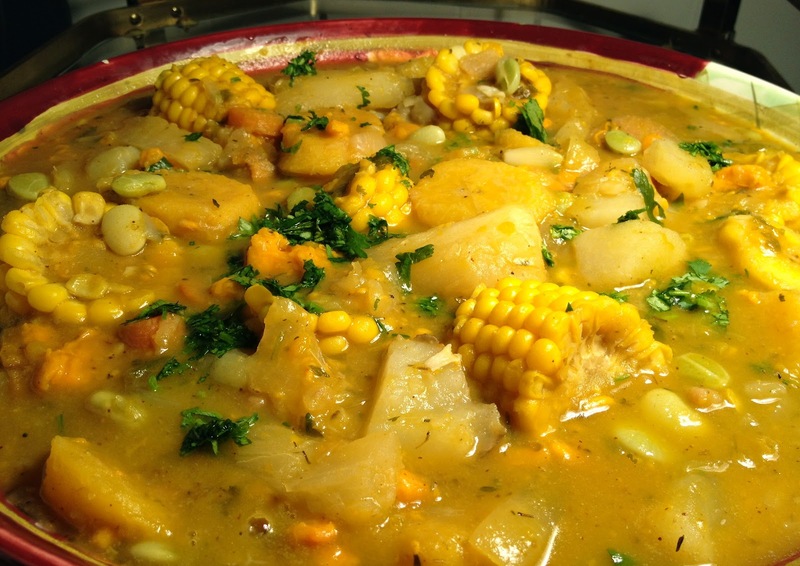 Easter sunday– VEGAN SANCOCHO on my mind- I did it! It came out spectacular! I can almost hear my Dominican friends yelling in the background– “Sancocho is from DR”.. lol so I decided to do some research. It’s a popular dish in Colombia, Dominican Republic, Puerto Rico, Equador, Panama, Argentina, Venezuela and Cuba- all having their own variations! Researching a bit further, I find, interestingly enough, that it’s origins are actually in Spain and the Canary Islands! This is close to the original recipe in the vegan book with just a few more items! Sweet plantains- cut on a diagonal in slices- yummy! PROTEIN such as reconstituted TVP, seitan, lava beans or chick peas- I USED LIMA BEANS! I started with a big sauce pot as used for making Sunday gravy- lol- that’s Italian talk for “BIG POT”– cooking for a big family meal! For the record, I call it sauce not gravy. Anyway, I started with the onion family- onions, leeks etc.. and the chile, all sautéed in olive oil. When this was going really nice, I added the heavier vegetables like the pumpkin, potatoes and carrots. At this point I added the vegetable broth and water. Each step I let this soup really cook. Next step was the spices– that’s the fun part! Then the green plantains followed by the frozen vegetables. When it was almost finished I added the sweet plantains and re-spiced! I don’t think re-spicing was in the recipe but come on… we all do it! Half way through this SANCOCHO process, I called AMPARO- the one who was always responsible for all the sancochos I have had. [Thanks Amparo & Angela!] After she giggled at me for making it vegan (but proud at the same time)- she went over the ingredients with me- the only thing I forgot was GARLIC! Bad Italian I am- my grandmother would be rolling her eyes at me right now! I chopped some garlic in half way- and continued cooking, waiting and stirring. Funny thing is that I have usually had this meal over rice. I was going to make brown rice but how could I at this point. I had already turned this into a starch stew- but an incredibly fantastic one at that! Thank you for posting this! I am a Colombian vegetarian and have been trying to make sancocho this way too. You should see the looks I get when I order vegetarian versions of Bandeja Paisa at Colombian restaurants. 🙂 Looks delish!